Another option worth looking into is online writing groups. There are all sorts of online critiquing communities that act as a form of peer review. And they are all free. The payment is in terms of reciprocity: you critique other people's work, and they do the same for you. Some of them have measures built in to facilitate this. Although it doesn't cost money, to get the most out of these sites you have to treat them as a community and put time in. That’s fine with me, since whenever I read novels or short stories downloaded from sites like Smashwords I always leave reviews there and on Goodreads, plus I usually send the author an email with my thoughts, comments, and any typos spotted. What are some of the main sites you could use? Give me your hand, and let's go for a walk down Critique Lane. Ah, that's more like it! Simple to use, good explanations, and everything within a slick and attractive website. 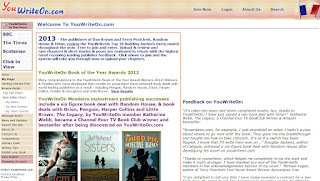 It feels like a social networking community for supportive writers. The system is easy to understand: add a critique of someone’s work, see immediately how many 'karma points' you gain. The ‘karma’ you earn then entitles you to post your own writing for feedback from the community. This site definitely gives you a good first impression, and that remains as you continue to use it. The karma system ensures that every work you post gets critiques which seem to be thoughtful and useful. The community encourages quality critiquing and gives advice here - it is actually useful for everyone, and applies equally to face to face writing groups. Of all these sites, this is the one I like the most, and is one of the two that I’ll be experimenting with in the future. 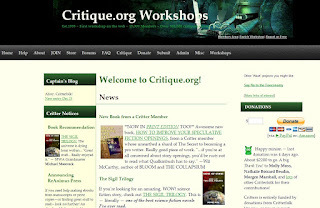 The critique.org site hosts many sub-sites, each covering a different genre - click on the drop-down menu here for a complete list. I joined the Critters Workshop (SF/fantasy/horror). First impressions were a bit confusing, since there are different logins for different workshops, lots of interlinked information screens, no apparent way of checking what you have registered for or what settings you have chosen, and it is mostly email-based with various rules for sending (specific text to include, formats etc) - I felt like I kept having to refer to the guides, unlike a site like Scribophile which was self-explanatory. I remember wandering round the critique.org sites, slightly lost and overwhelmed, which is not the best first impression. The site claims to have several thousand members. Members are asked for roughly one critique a week, with slightly complex rules about taking ‘holidays’. It isn't intended to be so 'drop-in' and flexible as Scribophile. To be honest, the complexity put me off getting involved, even though it probably becomes straightforward once you’ve made the initial outlay of time to get familiar with it. And the most important issue is the quality of the critique, which could be fantastic from this site for all I know, but having tottered around the edge of the community for a while I think I’ll put it on a backburner and stick to the sites I preferred above. A good example of confusion is that I spent time just trying to find the login button for the site, with no success, and it took a while to find out how to close the account too! Critique Circle covers all genres, and has fine-grained controls to cover who you want to see your work, when it is visible etc. 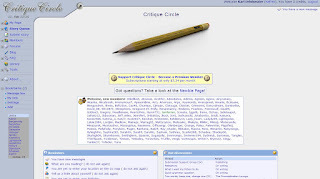 Unlike Authonomy, Critique Circle runs on a credit system where you ‘pay’ three credits to submit a story, and receive credits for writing a critique of someone else's story. The credits you receive range from a half to two credits per critique, depending on the length of your critique and the length of the story. It looks like you often get multiple critiques of your work (usually between two and ten) which means things won’t be ruined by one person whose tastes are very different to your own. Some people upload individual chapters of their work one after another as a way of getting feedback on a whole novel, though each chapter counts as a separate submission so you need to build up quite a bit of credit for this. The site also includes discussion fora and writing tools for manuscript progress, submission tracking, character generation and more. For example there is grammar advice here. Overall this feels like a professional and useful service. I’m building up my credit so haven’t had a chance to get my own works critiqued here yet as a test, but the quality of the critiques I have read seems high. This is one of the sites I’m keen to try out properly, and hope to write a post with my findings at a later date. Basically this site hosts files, like a forum, and you can comment on them if you want. The premise is simple enough but navigation is rather confusing and it is not as inviting as a site like Scribophile (below). I hadn’t logged in for some time and when I did so recently there didn’t seem to be a record of the work I uploaded and the comments I gave, which takes away some of my confidence in this site. Note that there is a two day limit for new members before you can upload anything. I decided to close my account with this site, since it feels rather cobbled-together and confusing. I’ve never tried this site but thought I should include it for completeness. It sounds a bit like Authonomy, though the site itself is rather cluttered and jarring (there are about ten different font sizes and styles just on the home page!) Apparently it has been going since 2006. 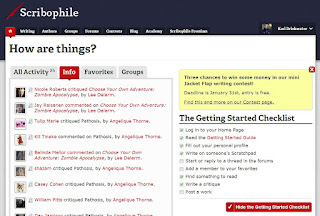 As with Authonomy, members upload opening chapters or short stories. A difference is that the YouWriteOn site randomly assigns these to another member to review. Each time you review other people’s work you are entitled to receive a review of your own. After five reviews the story enters a chart system and the highest rated writers receive free feedback each month from editors at large publishing houses such as Orion and Random House. 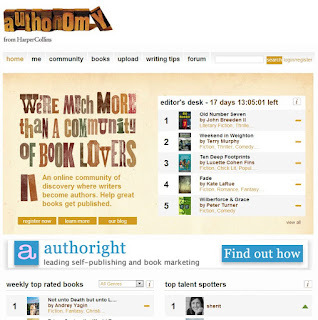 Authonomy is the Harper Collins site that was set up to replace the Harper Collins slush pile - instead writers would critique each other and Harper Collins editors would look at the works with the top community ratings each month. You can post partial or completed manuscripts or short story collections (minimum 10,000 words). 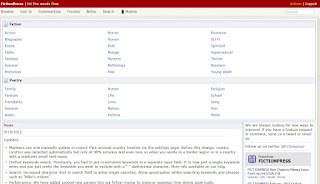 Authonomy users then rate and comment on your work. The site is easy to navigate through could do with an update e.g. their 'about' page still says “authonomy is a brand new writing community site” - it has actually been running since 2008. I used to be on Authonomy for many years. On the plus side I got lots of favourable comments on my work which could act as soundbites and promotion e.g. in the widget at the top of my navbar. Unfortunately many people are so focussed on getting readers and ratings for their own work (hoping to then get seen by Harper Collins editors) that they often give a cursory glimpse of as many people's work as possible, leave a quick comment, and hope it generates traffic back to their own. I got tired of personal messages from people near the top of the ratings begging for some more comments so they could get to the top. It started to feel less like a community and more like a race favouring spammers. Another irritation was that the text of people's work isn’t downloadable so you have to read it in your browser. This isn’t ideal for reading multiple novels! I yearned to be able to download the text and read it offline on an e-book reader in the garden. I left Authonomy a couple of years ago. I never wanted to do the spamming thing, and felt I was giving a lot more to the site than I was getting out of it. We leave the lane and return to the main road. Some of the houses we passed were inviting, some smart and professional, others ramshackle but friendly. We all like different things. Have you used any of these sites, or others? What did you think? Thanks for reading! Thanks, Karl. That's very helpful. I'll bookmark this to read again. No problem, let me know if you try any of them out! Many thanks Karl. This is useful experience and research. Much appreciated. My goodness, who'd have thought there would be so many of these sites? Gone are the days of the writer stuck in their garret all on their own staring at a blank page. Yep, the Web certainly brings things into your home. Hi Karl, looking forward to trying out Scribophile. I actually joined and got feedback from Critters.org. The feed back was helpful (I received about 10 to 12 critiques) but as you pointed out, the site is hard navigate. Another complaint is that it is a rather big time commitment. I am happy to provide feedback to other writers and feel like I do a good job. (Its a great way to learn about your own writing too.) But, working a full time job doesn't leave me much time to write, let alone provide feedback on a weekly basis.